Pemulwuy was an Aboriginal Australian man born around 1750 in the area of Botany Bay in New South Wales. He is noted for his resistance to the European settlement of Australia which began with the arrival of the First Fleet in 1788. He is believed to have been a member of the Bidjigal (Bediagal) clan of the Deruy people. 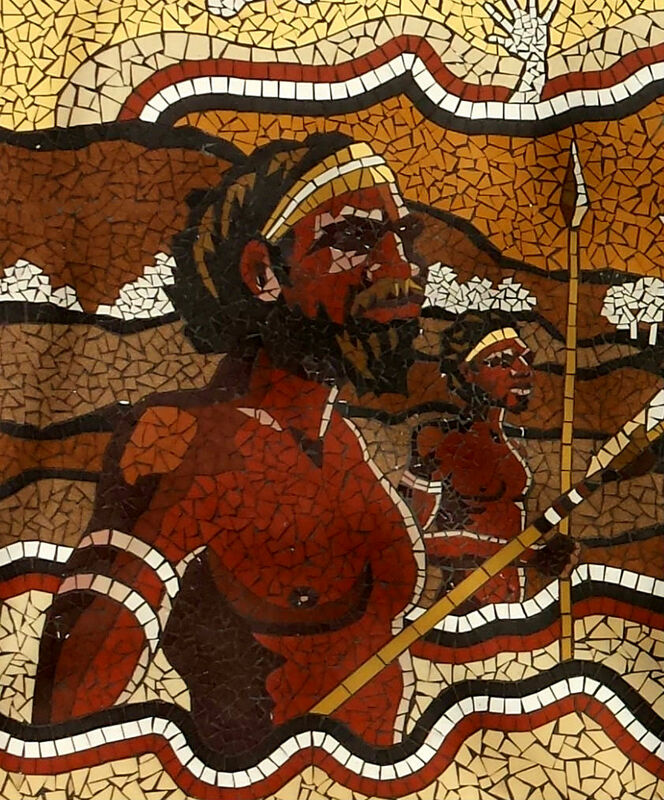 The Bidjigal clan were the original inhabitants of Toongabbie and Parramatta in Sydney. Pemulwuy persuaded the Eora, Dharug and Tharawal clan to join his campaign against the newcomers. From 1792 Pemulwuy led raids on settlers from Parramatta, Georges River, Prospect, Toongabbie, Brickfield and Hawkesbury River. His most common tactic was to burn crops and kill livestock. In May 1795, Pemulwuy or one of his followers speared a convict near present day Chippendale. In December 1795, Pemulwuy and his warriors attacked a work party at Botany Bay which included Black Caesar. Caesar managed to crack Pemulwuy’s skull, and many thought he had killed him, but the warrior survived and escaped. But this critically injured him afterwards. Despite still having buckshot in his head and body, and wearing a leg-iron, Pemulwuy escaped from the hospital. This added to the belief that he was a Karadji. Pemulwuy recommenced his fighting against the British by November 1797. However his injures had affected his ability as a fighter and his resistance was a smaller and more sporadic scale for the rest of his life. According to Uncle Richard Green, "with simple spears, rocks, boomerangs, stones, he [Pemulwuy] defeated the British army that they sent here. Every single soldier except for Watkin Tench, that they sent in pursuit of Pemulwuy either walked back into the community with their saddle over their shoulders or they didn't make it back." On 2 June 1802 Pemulwuy was shot and killed by a blinded British sailor Henry Hacking, the first mate of the English sloop Lady Nelson. The first song on James Asher’s 1996 new age album Feet In The Soil is entitled "Pemulwuy", and the last song is entitled "Pemulwuy Returns". Both feature didgeridoos. In 1987 Weldons published "Pemulwuy: The Rainbow Warrior" by Eric Willmot, a best-selling novel providing a fictionalised account using early colonial documents as source. Matilda Media re-released the book in 1994. In 2015 the National Museum of Australia installed a plaque honoring his role in Australian history as part of the Defining Moments project. In 2017 a Sydney Ferries Emrald-class ferry was named Pemulwuy.